The special election for Congress in the Pennsylvania 12th is in the last 48 hours. 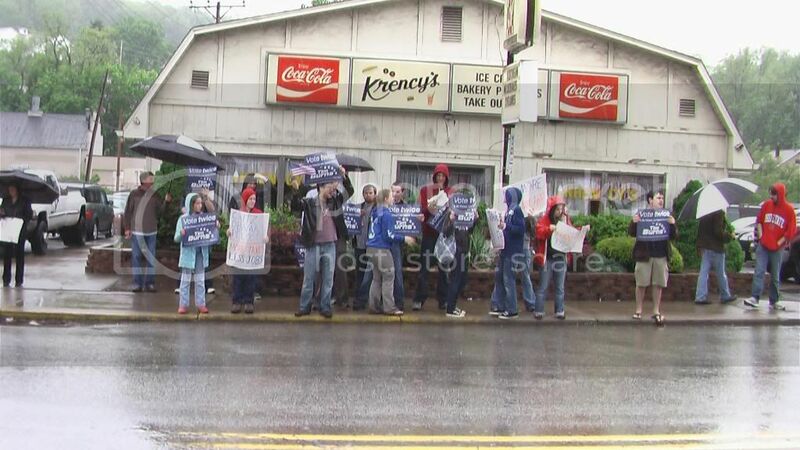 Earlier today, with all the call centers full, the Tim Burns campaign sent overflow volunteers out to greet Democrat Mark Critz as he made campaign stops in Washington, PA.
Burns supporters waiting for the arrival of Democrat opponent Mark Critz. This was the same phenomenon we saw in the Scott Brown race. So many volunteers for the phone banks that we were doing stand outs in the freezing cold. Here it's the pouring rain. 1) While Critz was out meeting voters one on one (something Coakley was now famously disdainful of), he did not engage with Tim Burns supporters. 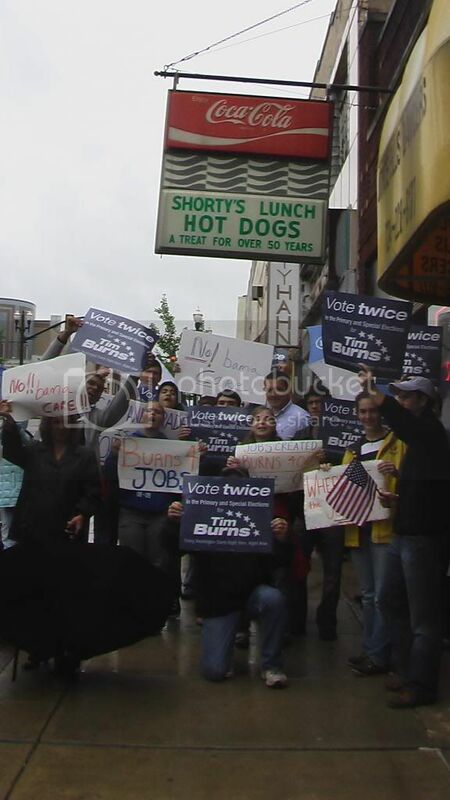 Scott Brown would work down a line of Coakley supporters shaking hands and thanking them for being part of the process. 2) There were 3 events in a 90 minute span. The Burns campaign organized supporters and got them transported to each location in time for maximum media exposure. 3) There were no Critz supporters in sight at any of the locations even after the Burns campaign had volunteers at the Critz meet and greets. There seems to be more than “excitement” gap favoring Tim Burns.